I have been feeding and encouraging mourning doves into my yard for years! 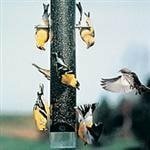 They are graceful and are lovely to watch. 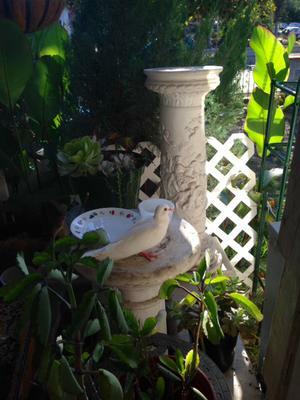 Then last week a beautiful albino mourning dove found my plant filled front porch a suitable place to stay! This dove seems almost tame, and although she hasn't let me pick her up, she tolerates my presence as I sit and talk softly to her as I fill her water bowls and food dish! She doesn't mix with the other mourning doves, but sits on pedestals on the porch and watches them. I have two birdbaths in the yard, within 10 or 12 feet from where she will perch. 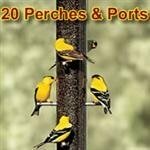 There are probably a hundred or more birds of different sizes, along with several squirrels who also visit daily. In the late afternoon, we have a flock of small black birds with brown heads. 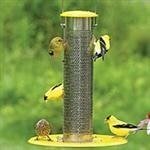 They always arrive in a group and take over the feeders. It is quite interesting to watch from my living room window. 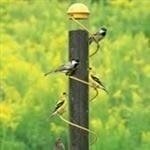 I wish I could get closer, but they will fly into the trees if they see me approach! Meanwhile, I've been checking on "my" dove, who I've named Grace, every few hours, to see that she's comfortable and has some available shade. I think I need to find something like a bamboo or grassy curtain for her, as it gets really hot outside, especially with summer coming! At least my succulents in baskets provide some privacy and shade! I'd love for her to be an indoor dove, but I'm not sure she would like that idea. The last day or so, she's been bravely joining the other doves on the ground and sitting on the edge of the smaller bird bath for short periods of time. And then next time I look she's safely back up on the porch! Usually sitting in her plate of food! Comments for Albino mourning dove has moved in! How wonderful! I read your article as I too today could not believe my eyes when I saw a white mourning dove. I did a little research and found it's called Leucistic , not albino but not having full color. Whatever it's called they sure are beautiful and I'm very happy you shared. I wanted to point this out because the previous comment said they release them for ceremonies and its not the same, this is indeed special. Thank you for sharing. 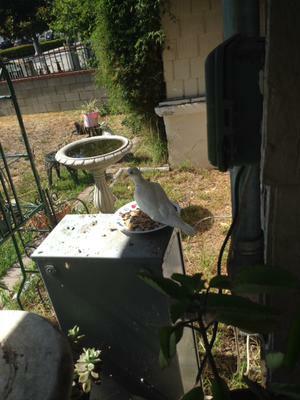 Unfortunately, white doves are often released at weddings and find their way to backyards.